The new and improved user interface included in Aeries version 8 was only just the beginning of the planned user experience enhancements to our web vewrsion. The Aeries development team is committed to improving on every page in the system to enhance the user interface and introduce brand new features. 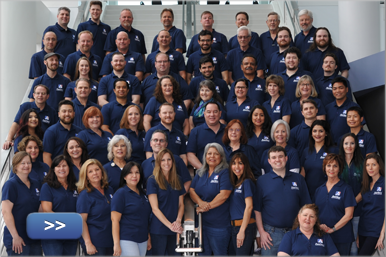 As part of this effort the Student Classes screen, where office staff and counselors view and edit student class schedules, has a streamlined new workflow and a reworked user-friendly design. Along with new features, this screen retains all previous functionality but wrapped in a new template to optimize usability and performance. In the past, manually entering a student into an individual section was a different process from entering course requests and letting the system schedule the student (aka – the Walk-In Scheduler). This new page combines these processes for a faster experience. Additionally, when in "Edit" mode, any class can be quickly changed or deleted and new courses or classes added quickly. 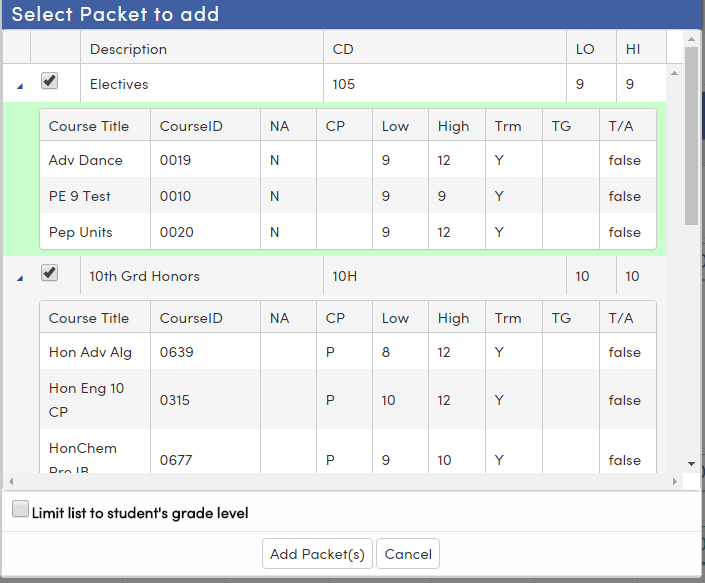 Fundamentally, this new design allows users to quickly view the available periods of a course and switch students between classes. This process starts off with a new, faster way of finding courses to add to a student's schedule. A new auto-complete search box allows users to add or edit courses. Then immediately after selecting a course, all available sections of that course are displayed for each available period, letting the user select the period and teacher in which to place the student. Information like "Term", "Seats Remaining", and "Days of the Week" are quickly visible with additional information only a click or mouse hover away. Available sections of a course are also color coded to make the visual experience even more intuitive and easy to use. Red means a section is full, blue means there are still available seats, and green indicates the current section associated with that course. The yellow color is meant to show the teacher in that section is overloaded if the Monitor Teacher Overload settings are on. The most significant advantage with this approach is that the class schedule adjustments are not saved until the final "Save" button is clicked. 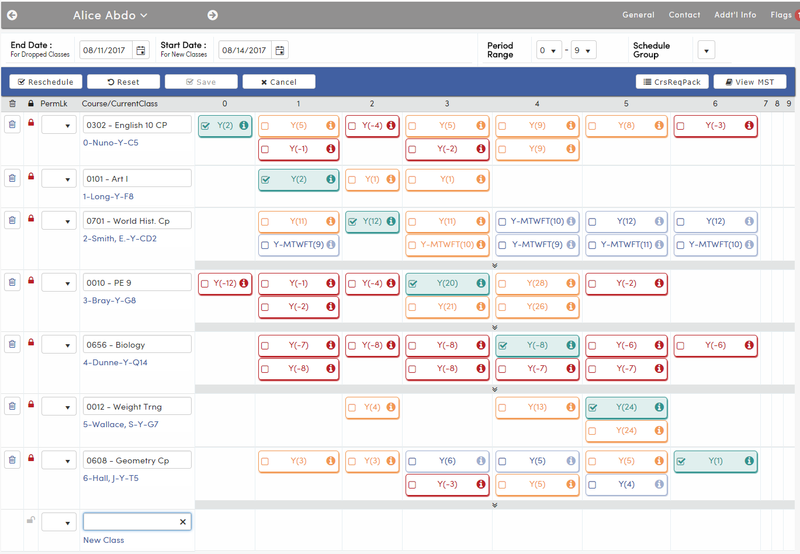 This allows counselors to try different "what-if" scenarios before locking in a final schedule for a student. Another option for entering course requests is the ability to select a course request packet, which now supports adding multiple packets at a time. These common groups of courses are customizable for each school and save counselors the hassle of looking up common courses every time they are needed. These changes will help streamline the jobs of counselors and office staff who face significant pressure to help as many students as possible perfect their schedules at the beginning of every school year. 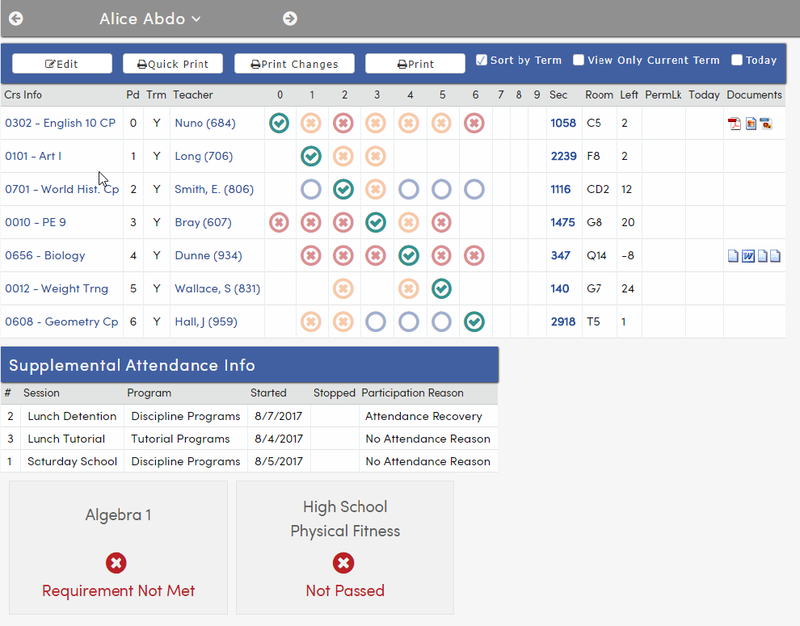 With quicker class schedule changes, counselors can find that perfect schedule quicker and get the student into their new classes right away, minimizing lost instructional time. For a helpful quick-start guide to the new Student Classes page, click here!